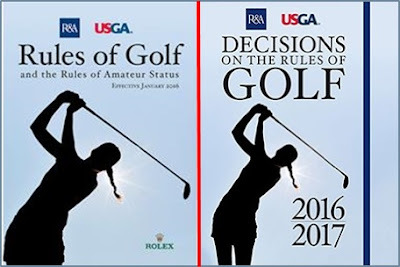 On Monday 26th October, the R&A and the United States Golf Association (USGA) announced the publication of the 2016 edition of the Rules of Golf that takes effect on January 1, 2016. There are four significant changes, including the ban on anchoring, which we have known about for some time. Interestingly, the cover on the new Rules book has departed from the practice of listing 'from' and 'to' dates, covering the four-yearly Rules review period. On the 2016 edition (see photo on left above) they have reverted to saying “Effective January 2016”. I am guessing that this means that the much talked about major simplification of the Rules that is being worked on by the two Ruling Bodies, may happen well before 2020. For speed and simplicity, I have copied most of the summary of the main changes to the Rules effective 1st January 2016 from the official press release, and I will probably go into more detail in future weeks, as the implications become clearer. This means that if a ball at rest moves after the player addresses it, the player is no longer automatically deemed to have caused the ball to move. A one-stroke penalty under Rule 18-2 will be applied only when the facts show that the player has caused the ball to move. Comment: This removes one of the most common retrospective penalties applied following armchair viewers phoning in to report a suspected breach. Effectively, the removal of the Rule means that there no longer will be any presumption that a player has moved their ball after grounding their club in preparation for a stroke. The same overall test in Rule 18-2 will apply to all actions by the player, whether they have addressed their ball, or not; they only incur the one stroke penalty if the facts show that any of their actions caused their ball to move. If they have incurred the penalty the ball must be replaced. A new exception has been introduced to Rule 6-6d (Wrong Score for Hole) to provide that a player is not disqualified for returning a lower score for a hole than actually taken as a result of failing to include penalty strokes that the player did not know were incurred before returning the score card. Instead, the player incurs the penalty under the Rule that was breached and must then add an additional penalty of two strokes for the score card error. In all other cases in which a player returns a score for any hole lower than actually taken, the penalty will continue to be disqualification. Comment: So, for example, a player signs their score card with a score of 4 on a hole. Subsequently, they are advised that they forgot to replace their ball on the putting green on that hole, having moved it one putter-head to the side on the request of a fellow competitor. Under the current Rule the player is disqualified for this breach, but the revised Rule means that their score for the hole will be 4, plus two strokes penalty for the breach and a further two strokes for the score card error, making 8 for the hole. Note that this exception does not apply to arithmetical breaches on the score card. Comment: There are two changes to this Rule. The first is purely a reduction in the penalty for using a device or equipment that is not permitted. For example, if a player uses a swing aid while waiting on a teeing ground they incur a penalty of two strokes, instead of being disqualified. However, if they are silly enough to do the same thing later in the round the disqualification penalty does apply. The second change confirms that a multi-functional device, such as smart phone or PDA, may be used as a distance-measuring device (if a Local Rule permits), but must not be used to gauge or measure other conditions, where doing so would be a breach of Rule 14-3. This removes the restriction on using a smart device for distance measuring because it is capable of other functions that are not permitted, even if they are not used during the round. The player will only be penalised if they access or use such information. As announced back in May 2013, the new Rule 14-1b (Anchoring the Club) prohibits anchoring a club either ‘directly’ or by use of an ‘anchor point’ in making a stroke. The penalty is loss of hole in match play or two strokes in stroke play. Comment: The most important point to understand about this new Rule is that it is not an equipment Rule; players may continue to use long-handled putters. The ban is to prohibit players from using an anchoring technique to make their stroke either ‘directly’ or by use of an ‘anchor point.’ There is an excellent, explanatory infographic, at this link, which in my opinion, provides the easiest way to understand the new Rule 14-1b. The above are the main amendments to the Rules for 2016, but there are other clarifications, or changes to the wording, designed to make some Rules easier for the player to interpret and understand. No doubt I will have more comments to make, once I receive information on these and any new, revised or withdrawn Decisions on the Rules of Golf effective from January 1st, 2016. As previously announced, I will update my ‘999 Questions’ book and various eDocuments with the revisions to the Rules of Golf and Decisions on the Rules of Golf, over the next few weeks. I will then send the relevant updated files to those that have purchased eDocuments from me since 1st April 2015. You don’t receive that service from Amazon! What happened at the 17th green on the morning of September 20th in the 2015 Solheim Cup could not have happened if the USGA would have inserted in parentheses in the "A" (answer) portion of Decision 2-4/3 the words "(either verbal or non-verbal)" immediately after the word "statement." The idea that a statement of concession has to be verbal in order to be valid is a LIE that is NOT supported either by the definition of the word "statement" in any English dictionary (a statement can be ether verbal or non-verbal) or by the language in Rule 2-4 or Decision 2-4/3 (Rule 2-4 does not specify the manner in which a concession is to be communicated, and therefore the statement that is reasonably interpreted to be a concession in Decision 2-4/3 can be either verbal or non-verbal). By not inserting that parenthetical, the USGA allows a referee to incorrectly rule that a concession has to be verbal in order to be valid (a LIE) and thus to incorrectly prevent a victim of a misunderstanding or a victim of an intentional cheat from replacing his or her ball without penalty and thus to defeat the intended purpose of Decision 2-4/3 (to protect from a penalty any player that reasonably believes his or her next stroke to have been conceded). There is a long history of referees correctly accepting (as being valid) non-verbal concessions in match play in professional golf. By incorrectly claiming that a concession had to be verbal in order to be valid, the referee in the Solheim incident violated Rule 2-4 and Decision 2-4/3 and incorrectly declared all those other matches (in which referees correctly accepted non-verbal concessions as being valid) to be invalid. It is unfortunate that you have posted your comment under a blog that is not relevant to the subject. The appropriate blog was dated 22nd September 2015, I would encourage you to read my summary of the incident there. Whilst I do not disagree with you on your point that concessions do not always have to be verbal (e.g. if a player picks-up their opponent's ball), I would certainly encourage players to wait for verbal affirmation before touching their ball. The fact, which no-one is denying, is that Alison Lee did not claim that she had received any kind of statement, whether verbal or by action; she wrongly assumed that the short putt would be conceded, a dangerous assumption in match play, where giving concessions, or not, can be an important mental part of the game. I suspect that you may say that Charley Hull gave an implied concession by walking off the green to the next hole. This has categorically been disproved; she was walking around the perimeter of the putting green to where her playing partner was standing, ready to move onto the next teeing ground when the hole was over. In my opinion, the act of turning away from a player after they have missed a putt is definitely not a sufficient 'statement' implying concession of a putt. You will gather from the above that I do not agree with your final sentence. In my opinion, the referee had no choice other than to make the ruling that he did, after gathering the evidence from the four players. You may not know that Brittany Lincicome admits that she was trying to tell Alison Lee not to pick-up her ball, but was too late. Suzann Pettersen has since apologised that she did not give the concession and that is good enough for me. It wasn't an assumption. It was a universally understood fact. Every player and every referee knows that a player immediately walking off the green in the direction of the next tee the moment that the putt of an opponent (the last player to putt on the green) comes to rest near the hole is a non-verbal statement that the next stroke is conceded and that the hole is completed and that the match is proceeding to the next tee. That act is so universally understood among players and among referees to mean that the next stroke is conceded that the only way that that act can mean anything else is if the player tells the opponent in advance (before walking off the green in the direction of the next tee) that it means something else (such as, 'Hey, Alison, I'm going to take a stroll over to Suzann now to have a little chat with her, so don't confuse this with a concession of the next stroke, because I'm not conceding your next stroke'). If the player does what is described above without saying anything to the opponent, then that act is in fact a universally understood non-verbal statement of a concession of the next stroke; and if the player subsequently claims that it was not a concession, then that player is lying and is actually withdrawing the concession in violation of Rule 2-4. However, my central point in my first comment was that even if the conceding player that subsequently denies (withdraws) the concession is not penalized (loss of hole / Rule 2-6) for violating Rule 2-4 by withdrawing the concession, the opponent must certainly be allowed to replace his or her ball without penalty in accordance with Decision 2-4/3, because interpreting the above-described act to be a concession of the next stroke is most certainly reasonable. That is why the parenthetical '(either verbal or non-verbal)' needs to be added immediately after the word 'statement' in Decision 2-4/3 in order to prevent the referee from FALSELY claiming that the statement that is interpreted to be a concession of the next stroke has to be verbal in order for the interpretation to be reasonable. As for the idea that a conceding player SHOULD communicate the concession verbally, neither the language in Rule 2-4 nor the language in Decision 2-4/3 either states or implies that a player's statement SHOULD be communicated verbally. Further, if the player is mute or if the player has laryngitis, then the player CANNOT communicate a statement verbally (an utterance) and MUST communicate the statement non-verbally (an action or a gesture). According to the INCORRECT ruling of the referee at the 17th green in the 2015 Solheim Cup, since a player MUST communicate every statement verbally (according to that referee), therefore a player that is mute or a player that has laryngitis CANNOT ever make a concession, because (according to that referee) every statement of concession MUST be verbal (which of course is NOT true). I find your comments on this subject so over the top that for the very first time in 7 years of blogging I am not going to try to respond. Suffice it to say that think that your opinion on the incident in question represents a very small minority of those that have bothered to check the facts of the situation. Hi Barry, Not sure if this is the right place for an 18-2b question but here goes. What is the ruling in very windy condition when the act of addressing the ball on the green causes an eddy in the wind that moves the ball? It is clearly wind that has moved the ball but the movement is also linked to the act of addressing the ball? If it is known and virtually certain that it was wind that caused the ball to move, no penalty is incurred. However, this is a circumstance that I have never encountered and it would have to be an extremely windy day before I was convinced that it was an "eddy in the wind" that caused the ball to move after address. Hi Barry. Relating to the ball moving after address. If a ball has come to rest on a sloping green and it subsequently moves very slighty after addressing it would the played be penalised? There is a slight breeze. A combination of gravity and possibly the wind could have caused the movement but how can this be proved? Or does it have to be proved that the player caused it to be moved in order to be penalised and is therefore given the benefit of doubt in this scenario. It is essentially unknown as to what caused the movement. Any guidance appreciated. Guidance on this matter is provided in Decision 18-2/0.5, which I recommend you read in full. Briefly summarised it says that all relevant information must be considered and the weight of the evidence must be evaluated as to what caused the ball to move. If the weight of evidence indicates that it is more likely than not that the player caused the ball to move, even though that conclusion is not free from doubt, the player incurs a one-stroke penalty under Rule 18-2.